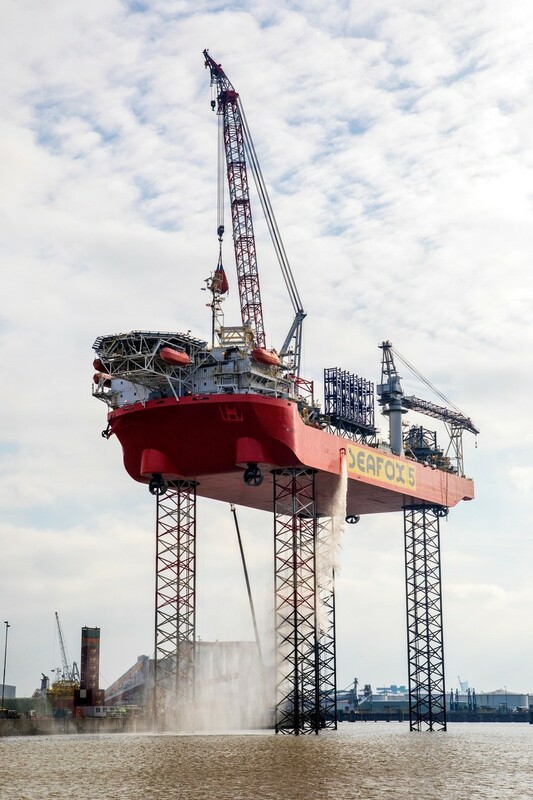 The 151-metre, self-propelled, DP2 jack-up rig Seafox 5 has left the Damen Verolme Rotterdam (DVR) shipyard following a four-month refit in which the boom of its main crane was lengthened to prepare it for a new contract, along with a range of maintenance and other upgrade works. Seafox 5 is now equipped to undertake offshore wind projects involving the next generation of larger wind turbines in water depths of up to 65 metres. Delivered in 2012, Seafox 5 is owned and operated by jack-up specialist Seafox BV; the world´s largest offshore jack-up ASV / offshore support company. 151 metres long and with a breadth of 50 metres, she is the largest vessel in the Seafox fleet and has a 1,200 tonne main crane and accommodation for up to 150 personnel. Her arrival at DVR in September last year marked her first time in drydock since her initial delivery. The primary reason for the visit was to lengthen the main boom of her Liebherr crane. This will enable her to fulfil an upcoming contract with GeoSea to install 66 six-megawatt wind turbines at the Merkur wind farm off the coast of Germany. While she was alongside, a series of other works were undertaken including a special periodic survey, testing the jacking system up to 70-metres above sea level, renewing the leg guide wear plates, installing a secondary Sormec crane and a repaint. Damen has a longstanding relationship with Seafox, with the latter’s vessels regular visitors to both DVR and Damen Shiprepair Amsterdam. The most recent arrival is the Seafox 2, which moored at DVR in the early hours of the 4th of February for some minor maintenance.